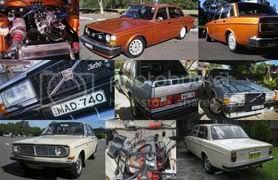 ... & I don't know if there's another 21yr old who owns a P1800E (x2), 242 (x2), 245, 142. .
Last edited by Super1800GTR; 01-07-2006 at 11:28 PM.. Original, new, unused volvo 1128794 shocks. The orange ones. Original volvo driving computer. Shows current speed, fuel consumption, time and some other stuff. Original volvo digital clock with alarm and original volvo digital outside temperature meter. With true 80s style green LCD-displays of course. volvo b19et engine. Only few hundred were made. Some tax-brake engine or something like that. Has forged pistons as standard, and the block is very sturdy. Only downside is the cubic capacity, which is only 2 litres. I forgot I have a nearly complete collection of European Car magazines from about 1987 - 2002. Plus some random issues here & there (earlier & later). Well, there isn't many 21 years old people, who adore volvos. I'am currently looking for P1800 or a 242 or a 262. Shame, there isn't many of those in europe. a 780, if that counts. who wants the B20 out of it? Probably not rare, but I have a collapsed '78 GT space saver spare, plus the appropriate mounts & braces for said tire. Significantly rarer but of questionable origin is the underhood-mounted air compressor I got from the same car, so that the driver could inflate said tire. Rarer still, it works. I have all of those and the carpet material jack/tool bag as well. I have a 28mm 4cyl sway bar. 1. 200 series sedan rear window shade for inside of car (blue). 3. I have the led hammer to take the Volvo center locking spoke wheels knock-offs on/off with. with 22:1 compression and 1 bar manifold pressure. various eggcrate grills for both models 700's and 940's. I didn't know Belgian cars were rare... both of my volvos are of Belgian descent. I don't have enough of the fun stuff I want. Some of what I have is fairly rare, but nothing really special. tan R-sport windbreaker and black R-sport V-neck sweater. A couple R-sport/GT instrument clusters on the shelf. The hard plastic floor consoles Pat mentioned above. Uninstalled Genuine Volvo car alarm for 240. Late 80's version. 20mm rear wheel spacer kit. R-Sport 3 spoke steering wheel by momo. black leather headrest pads for 75-85 240's, plus two sets of vinyl pads. 93 240 armrest w/ cupholders. Dealer license plate inserts for some 80's Volvos. Leather steering wheel center for the GLT wheel. Volvo trunk spoiler, genuine accessory made by Zender. Working accessory power antenna (the later square trim one). Factory tweeters. Useless, but really cool looking and rare. And about a dozen accessories catalogs, various countries and languages and years. I also have a set of the early DL ecodes (the almost square ones). edit: uncracked black dash too..
Last edited by ZyreX; 06-06-2006 at 02:42 AM.. I want, I want, I want, I want, I want, I want, I want, I want, I want, I want, I want, I want, I want, I want, I want, I want, I want, I want, I want, I want, I want, I want, I want, I want, I want, I want, I want, I want, I want, I want, I want, I want, I want, I want, I want, I want.